Top concert performers and dancers give master classes. So why not a top beader? 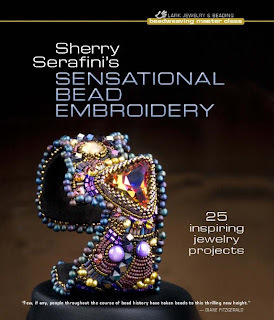 That's what Sherry Serafini's gorgeous book, Sensational Bead Embroidery , is all about - master classes for intermediate advanced bead embroiderers in the comfort of their own homes. This type of beadwork involves sewing the beads onto a foundation. The whole piece is then backed with suede for a neat finish. While Lark Crafts only recently sent the book for review, I had already been drooling over a couple of the free design tutorials over on their site. Shown below are the Arizona Sunset Earrings and the Rock Star Cuff projects which are available as pdfs. For more larger and detailed preview pictures, click here. Her 25 designs in the book are a testament of Sherry's graphic design background and her marvelous ability to let spontaneity take hold in the creative process. While she does cover basic ground rules and stitches, the defining thread in this book is teaching the experienced beader her design approaches. She also shares tips on her preferred materials such as Lacy's Stiff Stuff as a beading foundation and the use of paper templates for the statement pieces like for the Perfect Union design below. How does one set cabochons and rivolis - crystals with pointed tips? She's got that covered too. While there were some smaller pieces, many of the projects were much larger and will take a committed beader many hours to finish. So if you are a restless creative soul, designing these intricate pieces will go a long way into soothing it. Sherry herself spends 6-8 hours a day, 5 days a week just beading. The rest of her working time is spent on the non-beading part of the business. Sherry says, " My beadwork is a free-flowing expression of who I am. I do it for me. I don’t create with any concerns about whether someone else will like my designs or not." These are the fighting words of a true artisan! While you may not personally like to wear such large bold pieces, there are others who do. Sherry counts on many performing artists as her clients. Sherry got her lucky start with Steve Tyler who saw and liked one of her neck pieces at a concert and her reputation grew via word of mouth. Read Lark Craft's interview with the author. As inspirational books go, this is one of the finest. It shouldn't just be on a bookshelf but on the coffee table for all to admire. Me, too! I wish I had 6-8 hours a day to bead though! This woman is so creative and talented. Since I started doing bead embroidery, Sherry has become my favorite bead artist! I could stare and drool over her work for hours. I just ordered this book from Chapters! Love her designs. If you are a self-learner, books are the most cost effective way of learning! And they are always there when you need them.